LeaPro Pest Control, Termite Control, Professional Cleaning & Power Washing…Live Clean! LeaPro has an impeccable Pest Control track-record of servicing Jamaica W.I. for over 30 years. 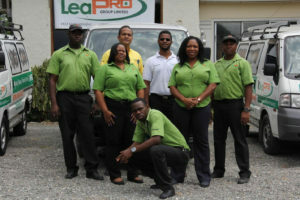 Built on the highest standards of integrity, LeaPro Limited is a Jamaican owned, operated and branded Pest Control, Pest Prevention, Pest Management and Professional Cleaning Company that is lead by Wayne Leahong and his extra-ordinary LeaPro Team. From 1986, LeaPro continues to spawn into areas that have successfully enhanced the LeaPro Pest Control business in Jamaica W.I. Standing in service for professional Island-wide delivery, LeaPro maintains a wide range of Commercial and Domestic Pest Control. Professional Cleaning and Power Washing Clients. Eco-Friendly & Safe – LeaPro’s goal is to ensure that your home or business is comfortable and healthy. LeaPro refuses to perform our duties at the expense of the environment and your own safety. LeaPro only uses PCAJ registered products. LeaPro is committed to providing professional, prompt, courteous, cost effective customer service. We work with you to provide a comprehensive service that meets all your pest control and upholstery cleaning needs. LeaPro gets the job done – We offer island-wide Pest Control and Cleaning Services 24 hours per day, 7 days per week. Ready to serve on schedule even on, Jamaican public holidays.